Scientists in the biotech and pharma industries spend a large amount of time and resources on researching sequences. However, often as researches progress to the later stages of R&D, they become blocked by competitors and products that are already on the market. Using a sequence searching tool which links to patent data can help you identify obstacles and freedom to operate much earlier on. Having access to a full data set sooner, can help you save time, money and enhance your R&D. 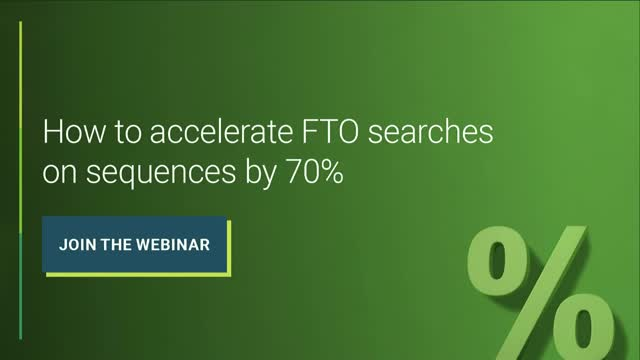 Join this webinar to find out how you can accelerate FTO searches on your sequences. Technology commercialisation at its core requires for an invention to be applied to a use case in a specific market. Doing this successfully will ensure that you are getting ROI out of your research and inventions. Mireya McKee has over 16 years experience in research, academia and commercialisation and will be talking about how she utilises technology trends to maximise commercialisation value. Patent licensing negotiations have an extremely high fail rate- this can be down to unfavourable licensing terms or weak patent portfolios. One of the ways universities and industry are trying to bridge the gap between innovation and commercialisation is by working together much earlier. From a university standpoint, their research can be tailored to specific industry needs, as well as having research costs covered. Through the eyes of industry, they can get their hands on the latest research developments, and attract the brightest and talented individuals to their businesses. Please note: All viewers will have their data shared with our guest speaker. A ‘Patent cliff’ describes a severe drop in revenue once the patent for a company’s leading product expires. The sharp revenue decline is a result of competitors being able to start developing and selling the product, often at a much lower price. As US biopharmaceutical company Celgene struggles to get regulatory approval from the FDA, the company is facing major market, shares and revenue losses, and is facing a phenomenal patent cliff. Furthermore, research from EvaluatePharma reports that an estimated $250 billion in projected sales is at risk between 2018-2024 as many drugs lose exclusivity. When it comes to acquisitions, the effects of a dwindling patent term can severely impact the value of your company. So how do you create 5-year plan to prepare for an inevitable patent cliff? We are very excited to welcome back Jurgen Vollrath, President of Exponential Technology Counsel, and customer of PatSnap. ET Counsel, advise clients on IP strategy & business alignment to ensure the most successful M&A and exit outcomes. - Predicting the potential impact a patent cliff could have on your business. UK Intellectual Property Office is going to be joining this webinar to explore some of the ways UK and Chinese companies can work together on innovation projects, where patents are involved. Social Impact Investment brings together capital and experience from the public, private and non-for-profit industries to achieve specific social objectives. The return of these investments is measured typically by the social outcomes achieved. The Centre of Advancing Innovation is a public-private partnership non-profit focused on identifying breakthrough inventions hidden in portfolios, to maximise investor returns and commercial success. Research performed by the group has highlighted that Social Impact projects accelerate innovation, and result in higher returns. - The influence on the future funding of projects. With innovation budgets increasing each year and R&D becoming more competitive, many organisations are getting creative in how they increase the reach of their IP protection. One technique is to widen IP claims by patenting human experiences induced by the product or service. This is often seen in the automotive and consumer goods sectors, commonly describing visual and tactile sensations around the original technology. - Why it will make it much harder for your competitors to trap you in litigation cases. Mature products, such as smartphones and cars, tend to become very similar – whether they are from different manufacturers or the latest model from the same manufacturer. Speed, power and slight changes in appearance become the focus for many companies. Marketing can make advances through insightful methods to dig deeper into opportunities from unmet needs – but the right science and technology are required to make them real. R&D teams have access to incredible developments in science and technology, such as artificial intelligence and the latest developments in genetics, but struggle to find how to link them with market opportunities. Opportunities become ‘market pull’ or ‘technology push’, without joining together. Innovation opportunities must connect customer needs with science and technology to be more than just ideas or technologies. This webinar will demonstrate how technology mapping can be used to discover new opportunities, whichever direction you start from, and how IP landscapes can then help you to make the right connections. Please note: Registrants details will be shared with the presenter after the webinar. In an age where technology and cars have never been more intertwined, experts believe the most successful automotive companies in the future, are the leaders in the smart manufacturing race today. A recent survey of automotive companies by Capgemini’s Digital Transformation Institute revealed that 49% of automotive companies have invested over $250mn in smart factory innovation. The ability to integrate currently siloed systems throughout manufacturing processes with smart techniques is clearly beneficial, and of course, it isn’t just about software and connectivity tools, it's about making better business decisions by using data to solve problems before they happen. But how can you begin making your organisation smarter? PatSnap is pleased to welcome Paul Mairl, Chief Digital Officer at GKN Powder Metallurgy. Paul has worked within GKN for over 25 years and is now responsible for setting up GKN Powder Metallurgy's digital system in line with Industry 4.0. In a recent survey by Harvard Business Review, it was revealed that on average, only 23% of participants said they learned about a competitors innovation early enough to respond before it hit the market. Whilst competition is inevitable, there are strategies you can implement to decrease the risk they pose to your business. • Competitors as opportunities, not just threats. Modern drug discovery appears in many ways to be well-defined with tried-and-tested approaches to acquire success. However, some research processes often lead to very few new discoveries and sometimes stagnation of an entire research area. So, does it always have to be this way? One method to re-boot a failing area of research is to employ disruptive chemical methods and thinking to kick-start a process of rejuvenation. - Can we identify the reasons why drug discovery is failing? - The ways chemical disruption can reverse failing drug discovery in the future. Over the last 10 years, China has evolved from a cheap manufacturing engine to one of the worlds largest patent filers. With initiatives like 'Made in China 2025,' we are seeing China set clear goals, moving away from imitation to strategic innovation. So what does this mean for your business? Should you see China as a threat or an opportunity? And how can you take advantage of this IP and innovation powerhouse in the future? PatSnap is pleased to welcome back Ian Harvey from Tsinghua University, Beijing & Imperial College Business School, London to share how he thinks many businesses should be managing the opportunities China's innovation holds. Conducting thorough freedom to operate (FTO) searches is an essential part of R&D and IP strategies for many companies. Outsourcing searches to external professionals can be highly effective but can come with its own list of risks and costs. So what are the ways you can lay the most effective freedom to operate searching foundations, before contacting a legal professional for their advice? PatSnap will be joined patent attorney, and Amazon bestselling author Dylan Adams, for an insightful webinar into how you can lay the most effective groundwork throughout your FTO search, whether you're using an in-house counsel team or an external law firm. Technology transfer offices are often seen as the facilitators of innovation between academic institutions and industry. However, they have a massive responsibility to transfer the wealth of innovation from within universities to the commercial world, in the most timely and cost-efficient way possible. Does the current Intellectual Property system facilitate their requirements, or can it sometimes hinder innovation? • Whether you need patents to have a successful university spin out. Although intellectual property is often a large asset to any innovative company it can be hard to justify to senior management the costs that come with it. Patents especially, need to be renewed yearly and also can become very costly in the case of infringement that leads to litigation. So how can you explain to your senior management that your IP is a key essential asset? This is what Nick Pay and Pete Hotten will be discussing in this webinar. Intellectual property is fast becoming one of the largest, and most valuable items on many organisations balance sheet. These assets can bring to light considerable risks, and opportunities, during M&A. By looking at the IP portfolio of an organisation, you can get an idea of whether you're strengthening, or weakening your market position and which assets will be the most valuable after the M&A. The primary reason why people register their IP - including trademarks patents - is to protect their ideas from being used and monetized by others. Companies across the world spend trillions of dollars on research and patent thousands of new technologies each year, so why would you ever need IP insurance? We see dozens of cases each year where companies and individuals are claiming infringement upon their IP and that's when IP insurance comes into play. PatSnap is joined by Erik Alsegard, IP Practice Leader and Lewis Parle, In-House Solicitor and IP Underwriter, from CFC Underwriting to discuss the whys and hows of IP Insurance. Join this webinar to learn about the risks of IP, if you should consider insurance and what are the pros and cons of the options available to you when it comes to protecting your Intellectual Property assets. The term innovation can refer to various stages within a product development cycle, and an invention created in this process can be protected by various forms of intellectual property. Most inventions are created to solve and address consumer needs and problems. To do that job, products enter the market, creating opportunities for the business or the inventor who owns it. A businesses’ IP strategy plays an important role in the success of a new product by ensuring competitive advantage in the market, for now and the future. However, IP protection can often be seen as an output of product development, leaving the organisation open to risk—whether it's in a new or an existing market. So how can you align IP protection with your invention creation to ensure your IP team is involved at the most effective points throughout the product development process? Too early could mean a slower time to market, and too late could mean lost opportunities in the market. Patent searching is something most IP counsel is very familiar with. It's your day to day when looking at Freedom to Operate, competitive analysis and portfolio management. However, it can be hard to predict what you need in a search when you are not a technical expert. In this webinar, we will teach you how to construct the most effective searches using boolean and a few other tips and tricks on how to ensure you include all the technical detail you need. Many companies have influence in markets because they make essential products. Think about the products all around us the metals, plastics and various other materials that make up our world. We can see how a change in manufacturing processes or supply could influence the whole industry. We are joined by Dr.Shafiq Kabir, Chief Innovation Officer at Smoltek AB, to learn how companies who rely on only Intellectual Property are working to change the market. Smoltek specialises in nanomaterials and their applications and brings together industry, intellectual property and manufacturers together. This is essential viewing for anyone interested in nanomaterials/nanotechnology, IP, licensing and market penetration. PatSnap answers the hardest questions encountered throughout the innovation life cycle—from creating new inventions to commercialising them. The tool stores in one place all the information typically consulted by R&D and intellectual property teams—including millions of patents, scientific journals, litigation data, as well as company technology and financial profiles. Our deep learning algorithms find patterns across these billions of data points, so you get game-changing insights in the blink of an eye.